What is a naming day ceremony? A naming ceremony is a non-religious celebration of the arrival of a new child. It is a way of welcoming the child and officially introducing him/her to family and friends. Naming ceremonies involve the important people in the child’s life – family and special friends. Parents have the opportunity to ask other adults to play a supportive role to their child through to adult life. Poems, readings and quotes of personal significance can be used throughout the ceremony. Often a symbolic gesture is also made such as the lighting of a candle, planting of a tree etc. In addition, certificates are presented to parents and other special people as a record of the occasion. Naming ceremonies are not a baptism or christening. While the ceremonies are non-religious, many parents with religious beliefs hold naming ceremonies to welcome their child. Doing so does not prevent the child from holding or participating in a religious ceremony at any stage of their life. While the Naming Ceremony and accompanying documents don’t have any legal status, they are a wonderful way to welcome your child and celebrate them as they begin their journey through life. 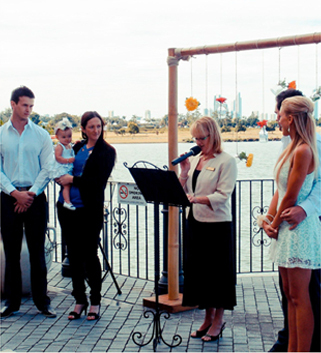 Each naming day ceremony is unique and is tailored to suit your individual needs.